And how long does it take to make Amish furniture? What do I need to know about ordering Amish furniture online? These questions and more, answered by DutchCrafters. As the #1 online Amish furniture brand, we have a lot of experience. And in our 15 years of furniture experience, we have learned a lot. Here’s a behind-the-scenes look at how to save time and money. This guide will help you find Amish furniture discounts, sales on Amish furniture, and furniture buying advice from amish furniture experts. Shop smarter, not harder! When is the best time to buy Amish furniture? After 13 years of experience as the #1 Amish Furniture retailer online, here are our top 5 answers! Stay right where you are. Number 5. In the morning! Here at DutchCrafters, we will take your call any time during normal business hours, but your personal furniture specialist is likely to have more time to talk in the morning, particularly between 10 to 12 Eastern time. That means more time and attention to your unique situation. This is also a good time for us to call our Amish woodworkers to help answer your questions and get back to you quickly. Number 4. After doing some research and comparing stain samples. We pride ourselves on being some of the foremost experts in Amish furniture. We encourage you to do some research with helpful tools, like our Timber to Table blog, DutchCrafters videos, and more, all available in our Learning Center. Start the conversation early and talk to a furniture specialist to select a wood type and order stain samples. Then, when it’s time to buy, you can have confidence in the furniture options you select. Number 3. Early in the year. 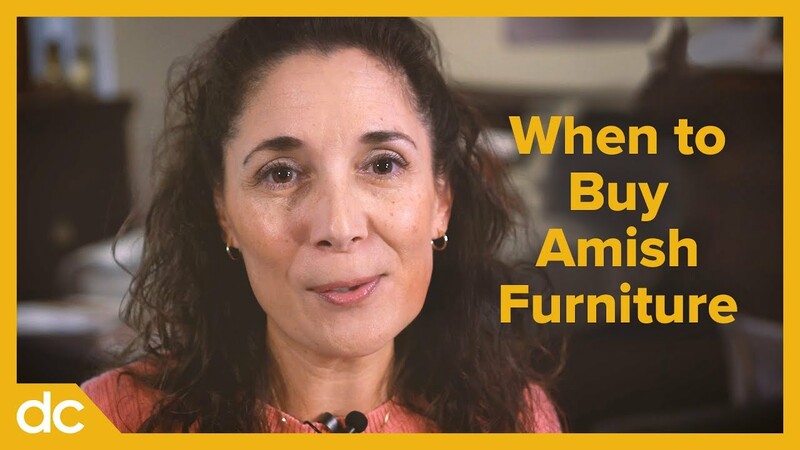 The busy season for indoor furniture wood shops is typically in the latter half of the year, so you may get your furniture faster if you order between January and May. What better use for that April tax return? For outdoor furniture, order in the fall or winter to avoid that spring time rush for outdoor products. Don’t worry. Your poly outdoor furniture will hold up in the elements throughout the winter. What do we mean by that? We know you like a good value and you might have your eye on a few different pieces, or even a whole room set. Order everything together and you save. First, we ship your entire order for $199 flat rate. If you add pieces to the order, delivery remains $199. The additional pieces get free shipping! Secondly, you can always call in and ask your furniture specialist whether you qualify for a companion or bulk pricing discount. We just may have something to help you out. Additionally, orders over $3000 qualify for just a 30% down payment. Reach that threshold and the full balance isn’t due until the order ships! We also guarantee that any set ordered together will be finished together to ensure a perfect match, even if the pieces are from different states. Number 1. In time for holidays or special events. Planning ahead will pay off. Quality customization takes time. Want a living room set or entertainment center for the Super Bowl? A dining table for Thanksgiving? An outdoor set for Memorial Day? For your perfect furniture made just for you, you’ll want to order at least 4 months ahead to ensure a timely delivery of standard indoor furniture. There you have it: our top 5 best times to buy Amish furniture. In the morning. After comparing stain samples. Early in the year. All together. And in time for holidays or special events. Can you think of anything we missed? Let us know when you’ve found to be the best time to buy furniture. I’m Beth Rice at DutchCrafters. Thanks for watching.